Is Elton John’s farewell on its way to cracking the Top 5 highest grossing tours of all time? The announcement of the Australian leg of Elton John’s Farewell Yellow Brick Road Tour has revived the number-crunching game. According to tour promoters Chugg Entertainment and AEG Presents, he does 15 shows November 30 to January 31, and three more in New Zealand after. When the farewell trek was announced in January 2018, the tour was first expected to gross US$420 million globally. This was based on 300 shows over three years and an average gross of $1.8 million from each show. But that has been upgraded, with rising demand due to growing “last time” sentiment and the wake f the May release of the Rocketman biopic, as well as the average gross now readjusted to $3.2 million. Farewell Yellow Brick Road was always going to be one of the ten highest grossing acts of all time. But the latest indications are it can crack the Top 5. Of actual shows ticked off since the tour started in the US in September, Elton grossed $42.5 million from 278,116 tickets over 41 shows. Four shows at Madison Square Gardens in New York alone took in $10 million. When factoring in the number of tickets already sold for shows this year in North America and Europe, Billboard puts the current gross at $79.5 million from 588,558 tickets. With Australia and New Zealand just added, there will now be dates to be announced for Asia and South America. “Among the most successful artists in history, John has grossed $1.2 billion since Billboard Boxscore began tracking touring data in 1990. 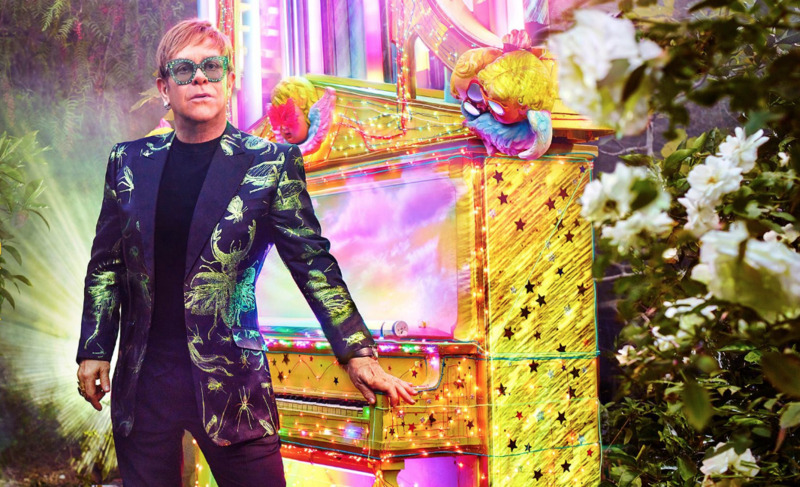 Elton wanted to go off the road to spend more time with his children, who will be 10 and eight when the tour wraps in 2021. After a break, he’ll be making records, working on musicals, and possibly doing residencies as long as they don’t include travelling. “I’ve been in the back of a van since I was 16,” he said. For the Australian tour, fans are expected to get the wearable live mixing app Peex. Elton partnered with the British platform for the farewell tour, available at select shows. They can choose to turn up Elton’s vocals or the guitar solos, and decide on the sound level during playback. The platform will also be releasing past Elton concerts on an ongoing basis.